This section, which describes how you can merge PSD layers into an image, is out of date. Due to the great complexity of this rendering process, PSD Processor was implemented in Graphics Mill. So, use the PsdProcessor class instead of merging the layers. customizing some template layers with personal details. This topic examines how to merge PSD layers into a bitmap and provides a simple business card personalization code. If you are unfamiliar with the PsdReader, PsdFrame, or PsdTextFrame classes, read the Loading Raster Layers and Loading Text Layers topics first. The PsdReader.MergedImageFrame property returns a Frame containing a merged copy of all of the visible layers. This frame is typically created and stored by Adobe Photoshop; however, there is no guarantee that this frame exists in any PSD file. The PsdReader.MergeLayers() method returns the bitmap of a merged frame (provided by the MergedImageFrame property) or merges visible layers one by one if the merged frame does not exist. The PsdReader.MergeLayers(PipelineElement) method allows for using a merged frame in pipelines. 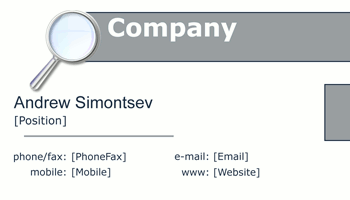 This part of the article examines graphic personalization, using a personal business card as an example. In the Personalizing PSD Templates topic, the same functionality is implemented, but it is done in a simpler way, using the PsdProcessor1 callbacks. If you are interested, you can compare the amount of code in both of the topics. There are many text settings available in Adobe Photoshop, but not all of them are supported by Graphics Mill. Therefore, when you create a PSD template, use only the settings described in the Loading Text Layers topic. Unsupported parameters will be ignored. Precise text rendering is a very complicated task, and it is practically impossible to achieve exact conformance with that which you get from Adobe Photoshop. The main cause of this is that Photoshop operates with its own rasterizer, which differs from those used in Windows (and Graphics Mill). Fortunately, only very rare tasks demand 100% image compliance. However, you should always recalculate the Y coordinate of the text output, because the Graphics.DrawText(Text) method inserts a small gap above the string, while the PsdFrame.Y property does not include this gap. To calculate the Y-coordinate properly, utilize the Text.GetBlackBox() method, which returns the tightest bounding rectangle of the string relative to the text output origin. This way, you can get the offset that should be subtracted from the Y-coordinate of the layer. // Create a PSD reader and the resulting bitmap, which will contain a merged bitmap. // Cycle through the visible raster and text layers. // width of the layer, then the bitmap will be resized to avoid design corruption. 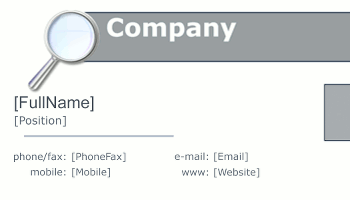 //Personalize the business card and save the resulting image.